I wanted to go as Jack Skellington from Nightmare Before Christmas but definitely didn’t want to go as superstore big hot mask Jack. I found a tight striped suit which I made some alterations to make a good fit. The shirt was a regular long sleeve button down with the collars pinned up. I purchased a bat from a local Halloween goods store and converted him with some zip ties, some rope and scissors to a bat bow tie. The makeup was a heavy base of white grease makeup and black to outline the mouth and hollow eyes. I slicked my hair back and used about 3 cans of white hair color. 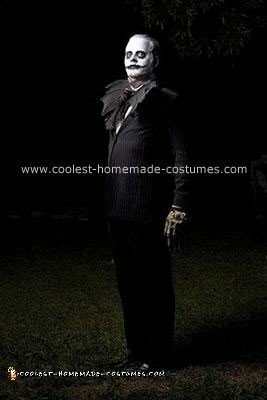 The skeleton gloves were found at Goodwill as were the excellent square toed shoes. All together a cool costume for about 20 bones. The photo was taken by a good photographer friend of mine named Joshua Spicka.